Over the course of this past year, I wrote a new post on average six times per month. I tested a lot of recipes, and you know how it is, some are a big let down while others just make your heart skip a pleasurable beat. I thought I’d share my ten favourite new recipes for 2015. Each has been chosen purely for eating pleasure although some also have used techniques in their making that have elevated the dish to the sublime. Those recipes have taught me be some unforgettable lessons and made me a better cook. I struggled with Paula Wolfert’s book The Food of Morocco when it came up at the Cookbook Guru. Every single recipe included an ingredient that is excluded from my diet, onions, garlic, dried fruit and wheat. In the spirit of participaton I adapted Wolfert’s Slow Roasted Lamb Shoulder with Browned Almonds. Slow roasting lamb shoulder was not new to me, but chilling the meat the reheating it bathed in the roasting juices was. I serve lamb shoulder Wolfert’s way now. There is nothing worse than being confronted with a piece of flabby fatty pork belly, especially when you know that when it’s been handled with skill, roasted pork belly is sweet and unctious and the crispy crunchy crackling, the perfect counterpoint to the fall apart meat. Kylie Kwong’s clear and precise instructions resulted in the very best pork belly I have ever cooked or eaten. I have lactose intolerance which makes it pretty tricky to enjoy ice cream, at least it was until Gelato Messina came into my life. I was sad to leave the gelateria in Richmond, but happy to have a copy of the eponymous cookbook. All the recipes including the dairy free gelato and fruit sorbets look quite technical until you start using them, then you realize it’s not time but temperature that’s important when making frozen treats. I can’t praise this book or the dairy free chocolate gelato enough, mmmmm. In the throes of packing to move house, the cookbook guru was cooking from Carol Field’s Italian Baker. Keen to use what I had to hand I made a total mash up of her recipe for Ossi du Mordere which freakishly made the most delicious sweet morsels of chocolate hazelnut meringue. Too good to be true. 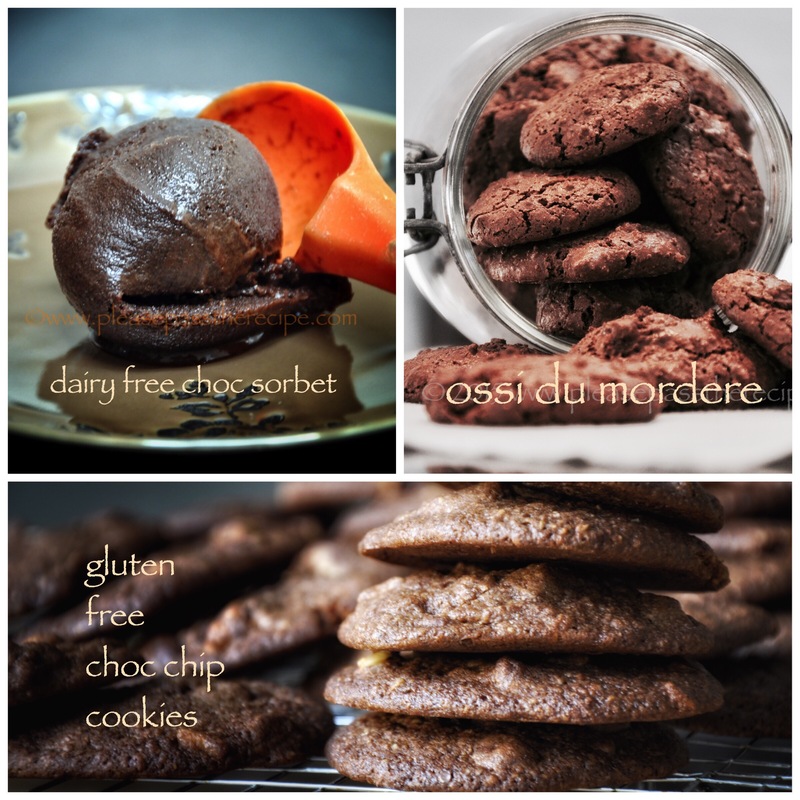 I was amazed by these gluten free choc chip cookies from Alice Medrich’s ground breaking “Flavor Flours,” a recipe book devoted to baking without wheat. Until I made this recipe, my experience making sweet cookies without wheat flour had been disappointing. It wasn’t a lack of flavour but an unpleasant and unpalatable powdery texture that frustrated me. I believe that in a blind taste test, even the most dedicated wheat eater would not pick these cookies as gluten free. This time last year I was deep in the exploration of Japanese food. While experimenting with hand formed sushi and fancy garnishes I had a light bulb moment which resulted in this delicious salad canape. My Prawn Salad with Avocado and Wasabi Cream will be making a guest appearance at Christmas this year. Twenty plus years ago I made a risotto cake from Claudia Roden’s “The Food of Italy.” I immediately saw the concept as having huge potential. During the summer months I make risotto cake at least once a month. My pumpkin, bacon and parmesan risotto cake is set to become a week night favourite. 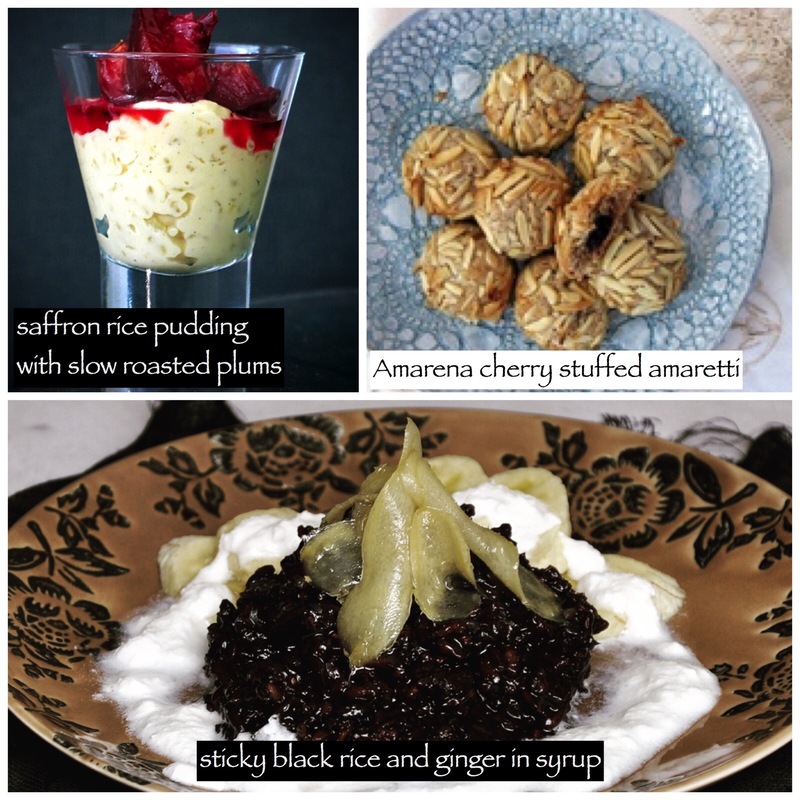 Of all the gluten free sweet treats I made in 2015, the Amarena cherry stuffed amaretti was my favourite, and also probably the most extravagant. If you love almonds, if you love cherries and if you love the marriage of both those flavours then you’ll be a fan too, but be warned they are seriously addictive. I’ve chosen them as my personal treat for Christmas. Rice pudding is at the top of my comfort food list, but I had never ever had rice pudding this good. Greg Malouf’s Saffron Rice Pudding from his book Saha reset my rice pudding benchmark. Teaming the sweet rice pudding with slow roasted blood plums was sublime, I can’t wait until late summer for the plums to be in season. I keep a plastic page filled with recipes clipped from magazines and newspapers. It’s frightening how long I’ve kept some of them. An inspiring and delicious breakfast menu at a local cafe prompted me to use one such recipe as inspiration for Sticky Black Rice porridge. It was the candied fresh ginger in syrup which elevated the dish to the sublime. Add a sliced banana and OMG. Wishing you all the best in this new year. I’m looking forward to more of your terrific recipes that inspire us all. Wow, what a food adventure you’re on! Everything sounds delicious and looks gorgeous! What a delicious year you had. Happy 2016! Happy New Year Sandra, you continue to inspire me. Aw thanks. Happy 2016, hope you’ve taken plenty of Aeroguard.. Happy New Year Sandra to you and yours – thank you so much for al your posts in spite of that monumental move not so long ago. Only realized now your ‘hesitance’ re Paula Wolfert stemmed from food intolerances . . .not being able to have onions and garlic would make my food life very difficult. Since I have never had a sweet tooth I must admit the lamb shoulder to being one of my favourite recipes from your list also . . .
Wishing you a marvelous New Year, full of new recipes, new friends, and old traditions! Wow, some real gems in this collection Sandra, and beautiful photos. I hardly know which one to try first! 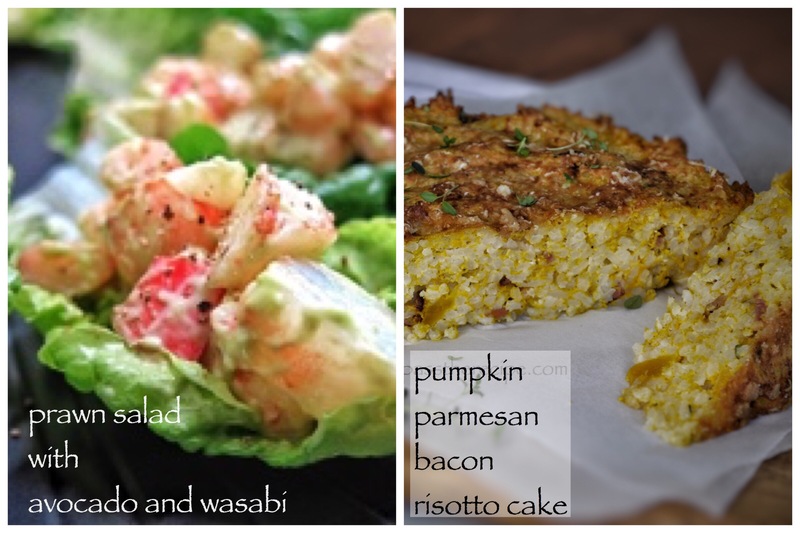 I think the risotto cake might be first though. Very best wishes to you for 2016! I’m looking at all these lovely dishes and remember the first time they appeared. which one will I pounce on? Anything with chocolate is out- it seems to upset me enormously, sad but true. The pork is off limits too. So I might settle for the risotto cake ( without the bacon but pop in some salty thing as a substitute), followed by that saffron rice pudding with plums. I’ll wait for the latter as the blood plums are still green but it won’t be long. Thanks for all your cooking inspiration throughout the year Sandra. It was interesting to look back, I hadn’t twigged at the amount of chocolate stuff I’d made. I’m not a great fan, but my other half loves the stuff so it was all for him. One week of peace and solitude before the Melbourne family arrive…. Haha, well it will be back to cooking for the troops again- enjoy the peace. This entry was posted on December 31, 2015 by ladyredspecs in Baking, Breakfast and Brunch, Dairy Free, Desserts, FODMAP diet, Food, Gluten Free, Gluten free baking, Lactose Free, Lamb, Light Savoury Dishes, Main Meals, Rice dishes and tagged FODMAP diet, recipes, top ten 2015.